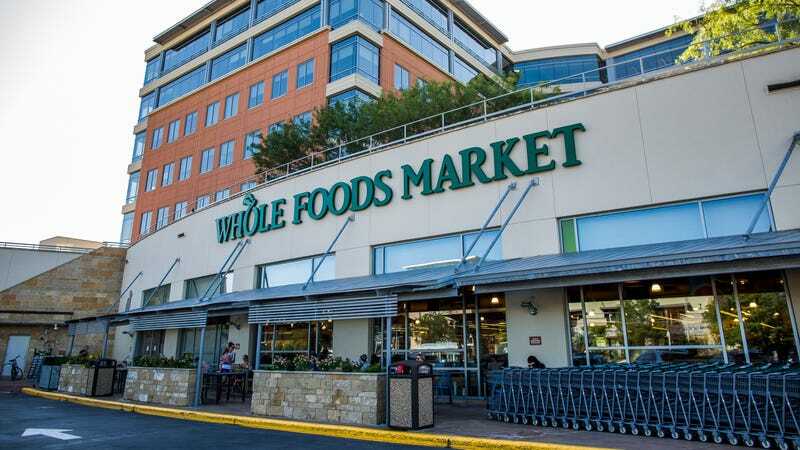 Amazon today announced the launch of grocery pickup at Whole Foods in select stores. Mashable reports that the program will start in stores in Sacramento, California, and Virginia Beach, Virginia, but will expand to other areas throughout the year—all part of a continuing quest to make it impossible for us to forget that hey, Amazon owns Whole Foods now. It works like this: Prime members can pre-order groceries through the Prime Now app or site, just as they would when placing an order for delivery (another AMAZON HAS WHOLE FOODS NOW GUYS move). Then, in the cities in which Amazon offers this service, customers can select pickup instead of delivery. This hypothetical shopper would then let Amazon know when they were en route, so the store could have it ready. Then the customer pulls into a fancy Prime Now pickup spot, and someone from the store hustles out with the groceries in tow. If you’re willing to wait for an hour, the fee for such a service is ZERO DOLLARS! If you’re in a hurry though, you can get the goods in half an hour for $4.99. Pickup will be available from 8 a.m.–10 p.m. This service joins a list that includes the aforementioned Prime Now delivery service, a host of changing deals and savings in-store available exclusively to Prime members, and involvement in Prime Day, Amazon’s annual giant marketing blitz.